The interior of this house is being redone, the Owner also decided to give the house a little bit of a face lift. 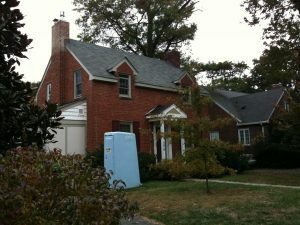 The existing roof wasn’t in the worst shape, it was a standard three tab shingle that was about 12 years old; no leaks, but it didn’t really add anything to the curb appeal. The Owner plans to stay here for the next 30 years so she wanted a roof she would never have to deal with again. The shingles we installed are GAF Timberline Lifetime. The color is Slate Blend; this roof with its copper flashings and great shingles won’t require replacement for at least 50-70 years. This roof does a few things; first, I think it looks fantastic. Secondly, since it will outlast at least three standard roofs it is keeping thousands of pounds of trash out of the landfill. Since the project started because the house needed an update, the Owner wanted something original, a jewel to make the house unique. 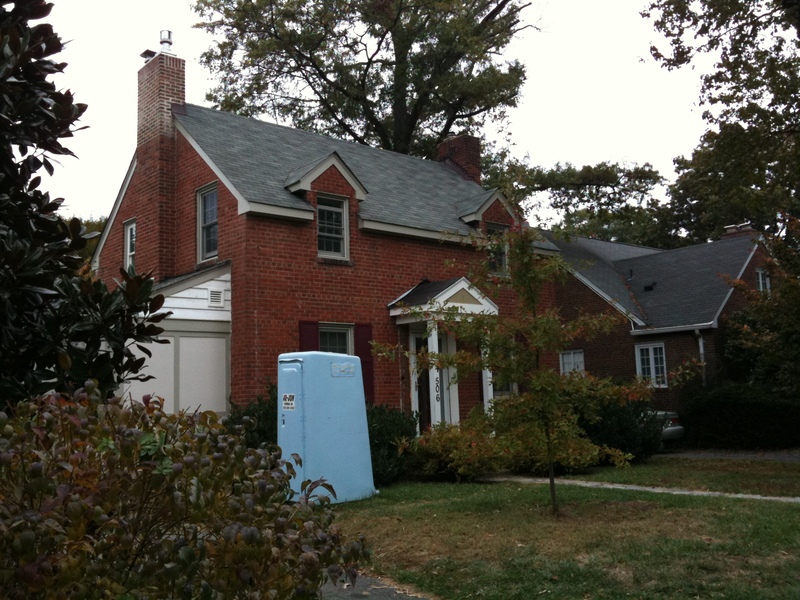 If you know Arlington, there are thousands of houses that look just like this one. 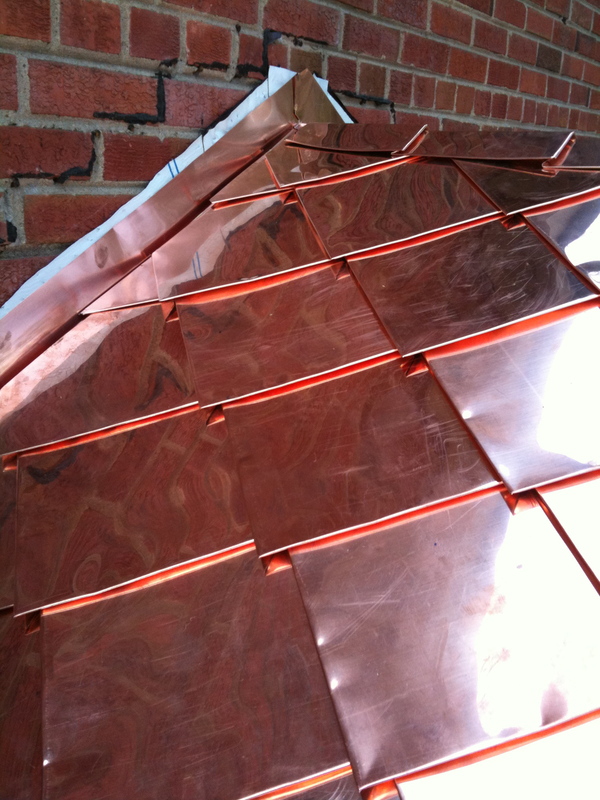 We came up with a few ideas; standing seam copper?, no. How about standing seam zinc?,no, too gray and dreary. 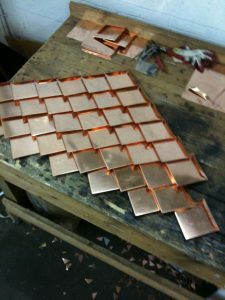 How about copper tile?, diamond shaped tile? That sounds perfect; do it!! 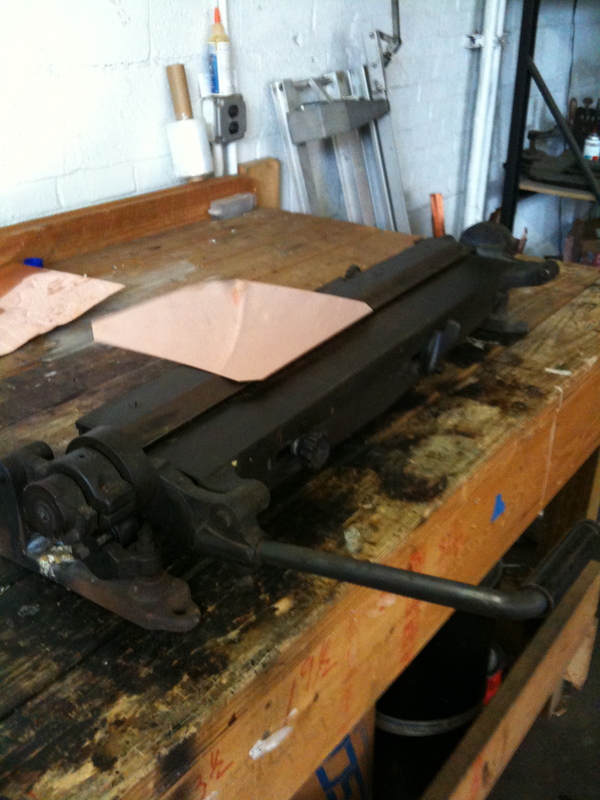 The machine to the left is a Peck, Stowe and Wilcox bar folder, it’s 135 years old and is one of my favorite machines. It does one thing; it bends a straight angle in sheet metal and is does it perfectly. When fabricating parts that are to be installed sequentially it is imperative that they all be perfect; if just one of these is off by as little as 3/32″ it can throw off the whole pattern. A closer view of the tile on the porch roof. 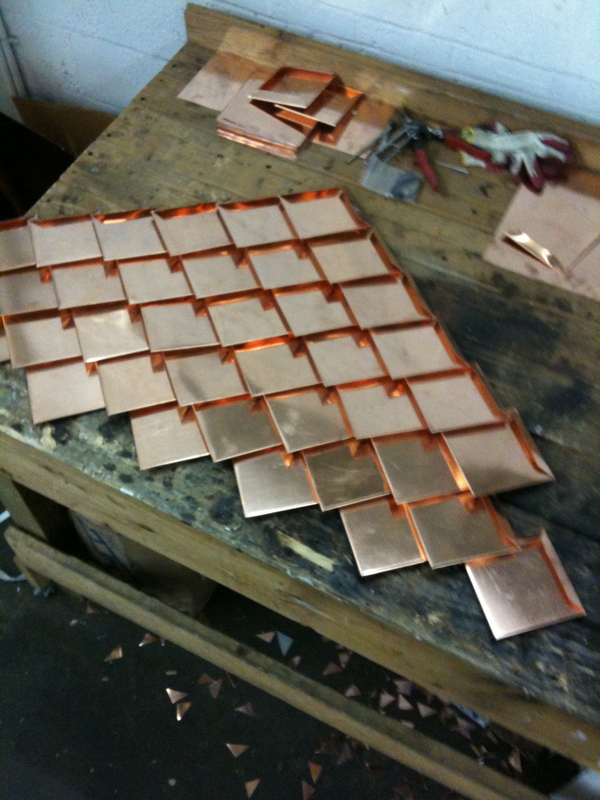 Each of the tiles are held in place with two copper hooks; I made the hooks out of scrap copper. The hooks are completely hidden so there are no exposed fasteners. All of the copper on the house is bright and shiny now, but in a month or so it will begin to turn a dark bronze color, a few years after that it will start to turn that beautiful mellow green. I can’t wait to see my tiles with a full green patina, I’ll have to put it in my calendar for 2015 to schedule a drive by. 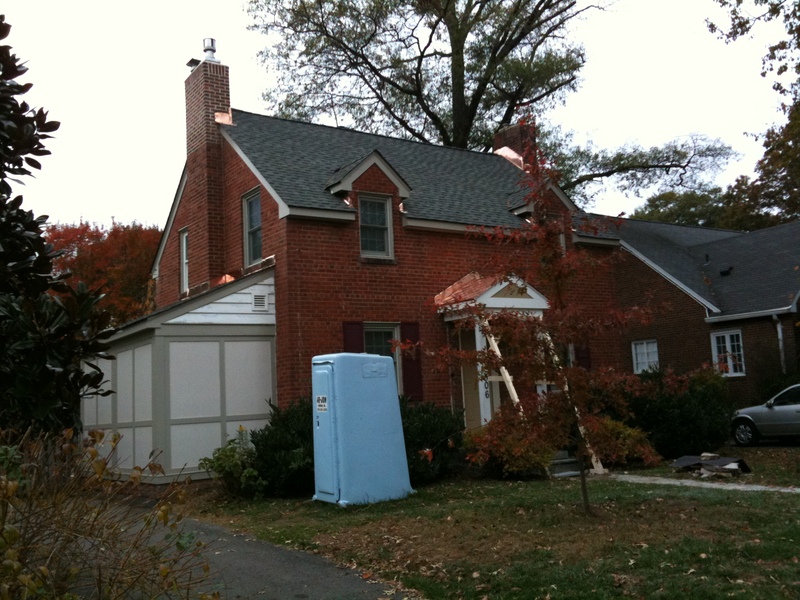 Our work is done here; the new architectural shingle roof and the one of a kind copper tiles give the house real curb appeal. 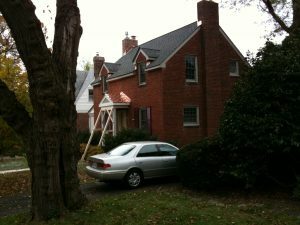 The bracing on the front porch will be removed as soon as the mason finishes the new slate walkway. If your place is getting lost on a block of identical houses give us a call. 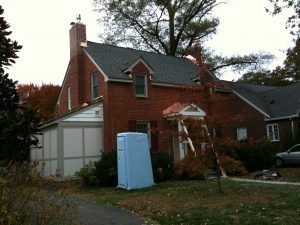 Id be happy to install a one of a kind roof for you too.